Current Mendel Center Mainstage series members and SMSO 2018-2019 Series subscribers can purchase tickets during a special pre-sale beginning Friday, April 13, at 10 am. Tickets go on sale to the public beginning Wednesday, June 13, at 10 am. “Last year’s partnership with Southwest Michigan Symphony Orchestra was a hit. Because of positive response, we’ve decided to follow up on that success this year with a show that will immerse the audience in the Grammy Award-winning, Rock and Roll Hall of Fame magic of Elton John and Billy Joel,” stated Mike Nadolski, executive director of The Mendel Center. 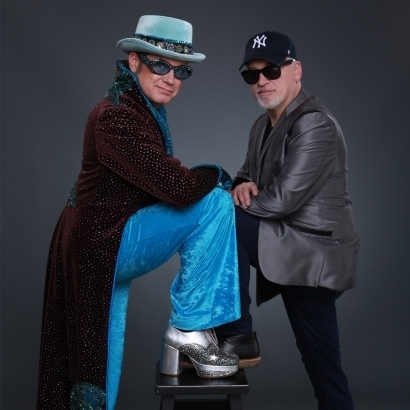 Broadway veterans Craig A. Meyer and Donnie Kehr bring these amazing Piano Men to life in an unbelievable concert featuring the legendary songs of BILLY JOEL and ELTON JOHN! Their hits include “Piano Man,” “Crocodile Rock,” “Just the Way You Are,” “Rocket Man,” “You May Be Right,” “Saturday Night’s Alright,” “Movin’ Out,” and many, many more. Craig A Meyerhas traversed all four corners of the entertainment industry, making strong impressions in theatre, film, television, and music. Television and film appearances include guest-starring roles on “Necessary Roughness,” “Will & Grace,” “Good Morning Miami,” “Family Law,” “General Hospital,” and “Fernwood 2nite” as well as working with Alan Menken on Disney’s Aladdin, and with Tim Rice and Elton John on The Lion King. Film credits include Leatherheads with George Clooney and Renee Zellweger, Joyful Noise with Dolly Parton, and Queen Latifah and Identity Thief with Jason Bateman and Melissa McCarthy. In music, Meyer has toured internationally and recorded with music legends Barry Manilow and Frankie Valli and has headlined for Princess Cruises around the world. Throughout Meyer’s busy career, he was repeatedly approached about his striking resemblance to Elton John and his uncanny ability to sound like the rock and roll legend. Meyer was eventually persuaded to expand his repertoire and began impersonating Sir Elton John. Today, he is considered to be the best Elton John tribute artist in the market whose strong vocals, striking resemblance, and amazing talent on the piano has audiences everywhere remembering when rock was young. As an actor, Donnie Kehr, created roles in landmark musicals Jersey Boys, The Who’s ‘Tommy,’ Billy Elliot, The Mystery of Edwin Drood, The Human Comedy, and others. His film credits include Clint Eastwood’s Jersey Boys, Oliver Stone’s Wall Street, and Chaplin with Robert Downey Jr. On television he has guest stared in House of Cards, Gotham, and Quantico. A musician and singer, Kehr as performed on two Grammy Award-winning albums for Best Theatrical Recording in 1993 for The Who’s ‘Tommy”’ and Jersey Boys in 2006 He recently produced the album Comfortable for Tituss Burgess, two-time Emmy Award nominee for The Unbreakable Kimmy Schmidt. 2013’s Motel Rasdell, winner of “Best Musical” at The Midtown International Theatre Festival. Pre-sale tickets for current Mendel Center Mainstage Series members and Economic Club of Southwest Michigan Speakers Series members will be available 24/7 at www.TheMendelCenter.comand through The Mendel Center Box Office at (269) 927-8700, option 1, Monday through Friday, 10 am to 6 pm, beginning Friday, April 13, at 10 am. That same day, pre-sale tickets for current Southwest Michigan Symphony Orchestra 2018-2019 Series subscribers will be available through the SMSO office at (269) 982-4030, and in person at their St. Joseph office. Beginning Wednesday, June 13, at 10 am, tickets go on sale to the public at www.TheMendelCenter.com, through The Mendel Center Box Office, and through the SMSO office. While discounts are not available for this special engagement, ticket purchases will count toward the needed number of show purchases for Mendel Center Mainstage series member status for the 2018-2019 season. The SMSO has been an integral part of the cultural fabric of our community since 1951 and is known for presenting innovative programming. In recent years, summer concerts have been introduced with concerts at the Shadowland Pavilion, Jean Klock Park, and the Heritage Center. This year, the Symphony will perform or sponsor more than seventeen concerts, providing a varied mix of live classic and popular music to cultivate and inspire a diverse audience through professional musical experiences. The Mendel Center raised the curtain on its first Mainstage season performance in the fall of 1992. Since that time, it has presented Mainstage season performances to more than half a million performance attendees. This is in addition to the hundreds and hundreds of other performing arts, national and international speakers, ceremonies, and community events hosted by other groups and organizations on the Mainstage. The 1,559-seat Mendel Center Mainstage Theatre offers state-of-the-art acoustics and comfortable seating in elegant surroundings. Amenities include free parking, handicap accessibility, and an array of special services including catering and bar service for private pre- and post-show events, booster seats for children, assistive listening devices, non-spill cups for beverages inside the theatre, and premium seats in the Stage Side section.